No pun intended but hot damn! 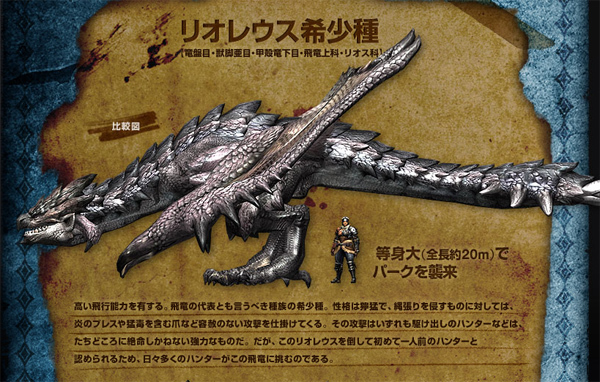 This will likely be the biggest Monster Hunter Event ever, both figuratively and literally. The event name is a quite a handful too. There will also be a replica of the Spa House and maybe Yukumo Village itself in Studio 8, as well as a realistic creation of the weapon and armors. For cosplay enthusiasts, the event will also feature weapons and armors from the game — this will be as great a resource as any especially if you’re looking to build those fancy armors. Of course, what Monster Hunter event would not have a tourney. Capcom will be hosting a Time Attack tournament for people who are interested. Prizes will include cash and Monster Hunter merchandise. As for any news on Monster Hunter Portable 3rd HD, it’s possible that Capcom will have a working demo (or at least more information, videos, etc) on the event itself but no information has been announced.